CTruk, a British boat builder specializing in high-speed composite marine craft, including catamaran workboats and wind farm support vessels, has delivered its first workboat equipped with Volvo Penta IPS (Inboard Propulsion System) to Sima Charters of Holland. 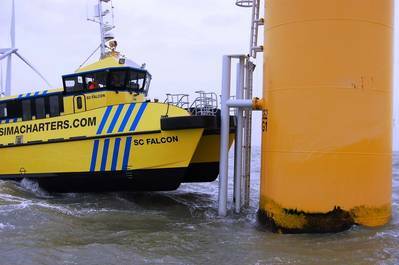 With its propulsion technology, including a joystick control for safe and easy docking, Volvo Penta IPS is suited for many marine commercial applications, as demonstrated by the SC Falcon CTruk 20T MPC offshore wind vehicle. The SC Falcon workboat has thus far impressed Sima Charters, a tender services and crew boat charter, with its stability and maneuverability, as well as its 25-knot cruising speed and top speed of more than 30 knots. Another benefit is the Volvo Penta dynamic positioning system, which allows the skipper to hold the boat’s heading near the turbine ladder and keep it steady in a limited area — even in 1.6-meter swells. The fuel efficiency of a CTruk workboat is a key feature; the Volvo Penta IPS-equipped SC Falcon burns just 105 liters of fuel per hour at 20 knots.